I’ll issue a warning: The surest way to screw up a perfectly good gun is to forcefully apply chisel-like instruments to its external surfaces. At the very least, those thin, crisp screw slots can get buggered. Much more frightening is the possibilities of gouged lockplates, furrowed stocks, or screw heads so badly damaged they must be drilled out to be replaced. I’ve seen all these things result from good-intentioned but incautious disassembly. Buggered and misaligned screws mar this otherwise lovely Austrian double gun. My desire to provide information about screwdrivers comes also from the number of loose screws I see in pride-and-joy shotguns and the limited access to competent gunsmiths to tighten them. I’ve also seen a few cracked stocks because the tang screws had shot loose. Wouldn’t it be great if you could feel confident about tightening loose screws? 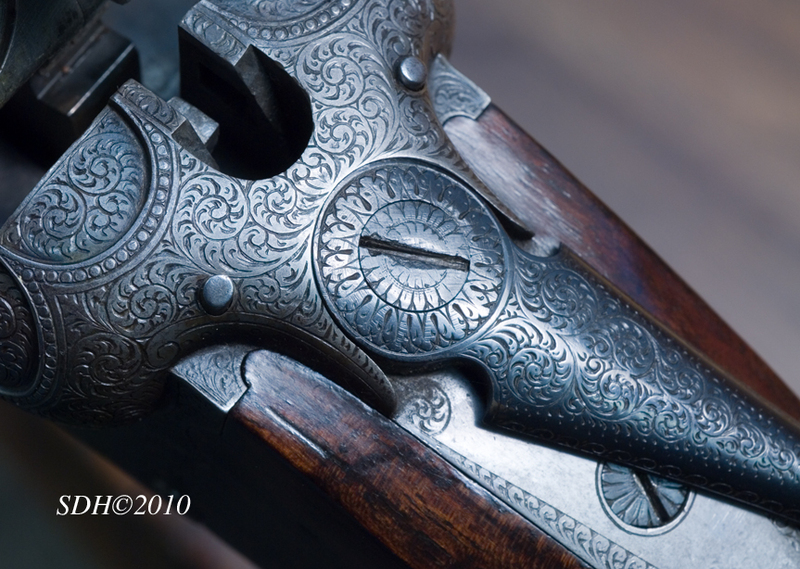 Most side-by-side shotguns have a similar number of screws in similar locations that fasten metal parts to each other and to the stock. Most screws have fine slots and should be installed tightly to prevent them from shooting loose. 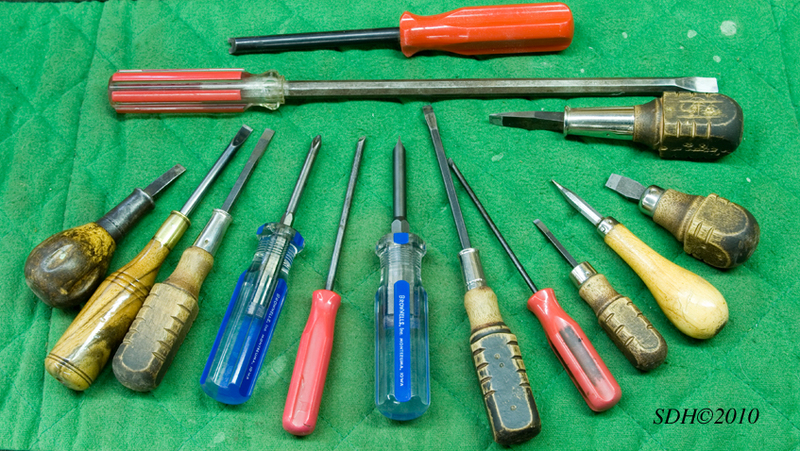 We use screwdrivers, or turnscrews as some smiths refer to them, to install and remove screws. (A gunsmith’s joke: What’s the difference between a screwdriver and a turnscrew? About forty-five bucks!) The screwdriver rack above my bench holds nearly two dozen mismatched tools, some of which I use every day. Besides those, I have a set of precision jeweler’s screwdrivers with tiny blades, a bench block with another assortment of bits, several long-shank (ten inches to twelve inches) drivers for stock through-bolts, Phillips blades for removing recoil pads, and a drawer full of specially ground blades for specific applications. Each screwdriver has a handle, a shank, and a blade. The handles are wood, metal, or plastic and should be proportional to the blade size to allow the application of proper torque to the screw head. I prefer wooden handles because I occasionally use them to tap gun parts into or out of place. Screwdrivers come in all shapes and sizes as shown in this portion of the author’s collection. Most shanks vary in length from 3/4 inches to five inches and are round, rectangular, or octagonal in cross section. Round shanks are best for removing deeply recessed screws as they are less likely to mar the edges of the holes. Round shanks are also proper for removing recoil pads that are slit—as opposed to having removable plugs—for access to the screw heads. A wrench can be used with a rectangular or octagonal shank to increase torque, but this can be dangerous. I have no idea why shanks come in different lengths, but I like the shorter type—no more than three inches—because I prefer to stay close to the work. Each blade is ground to fit a different screw head, slot depth, and width. Most blades are hollow-ground on both sides. Hollow-grinding makes the best blades for gun screws because the slots are cut with parallel sides; a properly hollow-ground bit also has parallel sides and will fill up the slot. It is equally important that the driver blade match the width of the screw head. It is less likely to slip out of the slot while transferring maximum force because it contacts both sides of the slot for its full width and depth. For example, a screw with a 3/16-inch head and a .020-inch slot 1/8 inch deep should be matched with a .020-inch blade just shy of 3/16 inches wide that will fit snugly to the bottom of the slot. 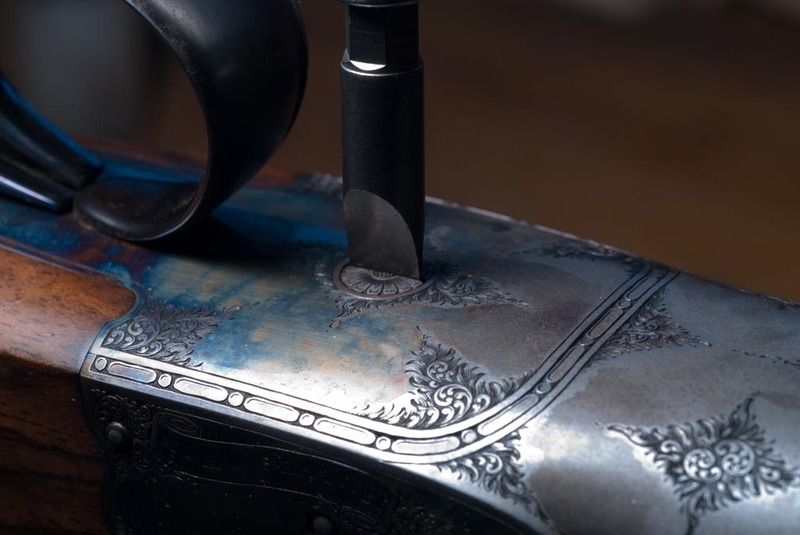 If the blade is too thin, or if it doesn’t contact the full width of the head or reach to the bottom of the slot, it is more likely to slip out and bugger the head or damage the gun. If the blade is even a tiny bit too wide, it can mar the surrounding metal when it’s placed into the slot. I looked at several assortments of professional-quality gunsmithing screwdrivers in the Brownells catalog for this story. The Browning set is an economical starter set, made by Grace, and so named because the drivers were made to fit the Browning Auto-5, which, for a factory gun, has relatively fine-slotted screws. The five wooden-handled screwdrivers range in blade width from .200 inches to .275 inches and are ground from .022 inches to .030 inches thick. Unfortunately, they are not thin enough for most British and European screw slots. Through the years I’ve reground several of these sets for friends to match the slots of their favorite guns. If you know a sympathetic gunsmith or are handy, the low price plus regrinding will get you into the ball game. These Browning drivers have square shanks, are forged of quality steel, and are appropriately hardened. I’ve used them for nearly two decades and have reground them many times. I suggest adding one smaller and one larger width and grinding them to fit the trigger guard and main tang screw (breech pin) of your favorite double. The screwdrivers are available individually or in sets from Brownells, Inc.
Brownells offers a mind-boggling assortment of screwdrivers for the gunsmith. Their “house brand,” Magna-Tip, employs separate handles and possibly one hundred bits that can be purchased individually or in sets. The bits are well made, precisely ground, and properly hardened. Each has a short six-sided section that slips into a magnetic socket on the handle shank. I enjoy having a wide variety of bits available, and with three separate handles, I’m not changing them all the time. I do prefer fixed-blade drivers for stubborn screws, as there is some wobble with the bits and standard handles. Brownells offers a locking collet-type handle that holds the bits more positively, although they don’t interchange as quickly because the collet must be hand-tightened. 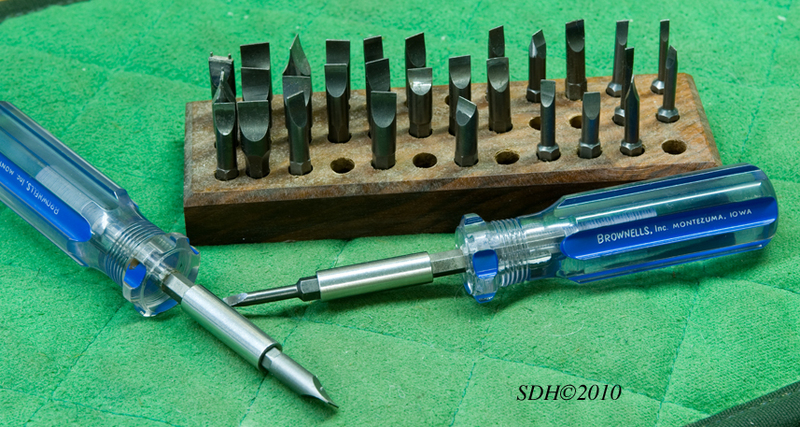 The most useful screwdrivers for double-gunners come in the Magna-Tip Thin Bit set. With eighteen bits in nine widths and .020-inch- or .025-inch-thick blades, these are the closest to correct size of any I’ve found. For the most part, this set will work well for the screws of many American-made doubles. A large selection of Brownells Magna-Tip screwdriver bits with many specially ground to fit thin slotted screws. Brownells also offers the Forester-Bonanza set, with round shanks and blades from .023 inches to .035 inches. This set has been a useful part of my screwdriver collection for many years and offers the only through-bolt, extra-long-shank screwdriver I know of. Pachmayr sells a Professional set of interchangeable-bit drivers. The plastic-boxed kit includes twelve straight-slot, seven Allen-head, six Phillips-head and three Torx-head bits. The slotted bits are .125 inches to .400 inches wide and the blades from .017 inches to .055 inches thick, with the wide ones having the thicker blades. This makes a good travel set for factory guns. The slotted heads could be custom-ground to fit your guns. Unfortunately, none of these screwdrivers have fine enough blades for many of the screws on imported doubles. The process of measuring screw-slot width is difficult and even dangerous. Using the pointed prongs of dial calipers (which are very sharp and will readily scratch gunmetal), I have carefully measured slots as thin as .012 inches. If you are going to attempt this, first practice on screw slots that aren’t in a gun. Then, after you’ve mastered the technique, secure your gun in a cradle so you have both hands to guide the calipers. I wouldn’t think of trying this without my magnifying visor on. I prefer to determine slot width first by eyeballing, then by carefully trying different blades until I find the one that fits perfectly. You’re less likely to scratch the gun by tipping one edge of the blade into the slot. Once the thickness is determined, find a blade that is nearly as wide as the screw head. Never use a 1/8-inch bit in a 1/4-inch screw even if the slot-to-blade thickness is a perfect match. Maximum force is generated at the outer edges of the screwdriver, and buggering is achieved by using a narrow blade in a wide head. Of course there are no standard slot sizes except in screws on machine-made American guns. To establish trends in slot sizes, I called gunsmith Pete Mazur, who has experience with doubles from all over the world. Mazur suggests that American screw slots are usually .020 inches to .040 inches; most English, Spanish, and German slots are from .015 inches to .030 inches, with some thinner; and Italian slots are the thinnest, at .010 inches to .015 inches. Keep in mind that these are only guidelines and that you can’t readily buy drivers for most of these screws. Chances are, if you’ve purchased some screwdrivers, or bits, the blades don’t fit the screws of your double gun. They must be ground to fit. If you’re not handy enough to regrind blades, you should think twice about using them on a fine gun. You can always ask a gunsmith to tighten the screws or to grind the blades. I regrind blades and Magna-Tip bits with a rotary stone chucked in a drill press. Brownells sells a large stone (1 1/2 inches in diameter) for Magna-Tip bits and a smaller stone (5/8 inch) for fixed or ultra-thin blades. I’ve found Brownells grinding stones to be aggressive and true, and they don’t load up with metal chips. These stones work well for hollow-grinding any screwdriver blades. Brownells’ suggestion of holding bits in a drill press vise often works well. Some bits, however, have their hexagonal section askew to the flat of the blade and are difficult to hold in a vise. These bits I carefully handhold against the grinding wheel, as I do with screwdrivers with attached handles. For those without a drill press, the grinding wheel can be chucked in an electric drill, which then can be securely held in a bench vise. If the grinding wheel isn’t firmly planted, it isn’t possible to correctly and efficiently grind screwdriver blades. 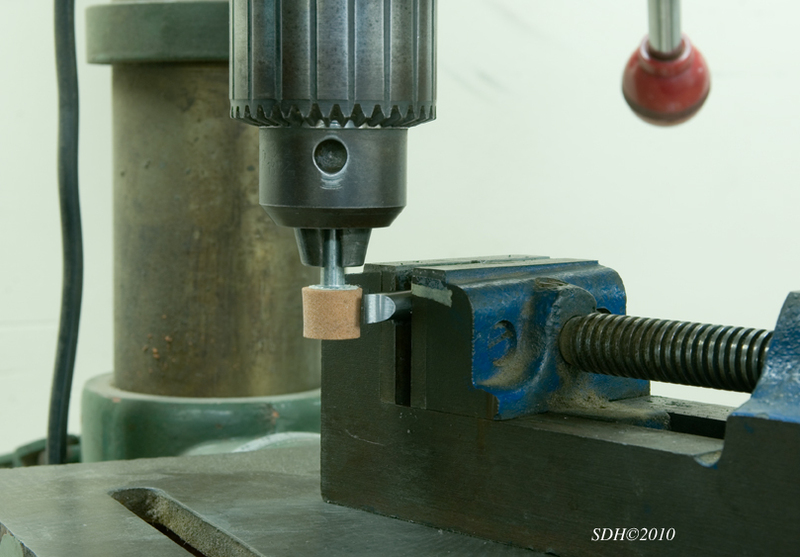 One method of grinding bits to perfectly fit screw slots is chucking a rotary stone in a drill press and clamping the driver bit in a small vise. 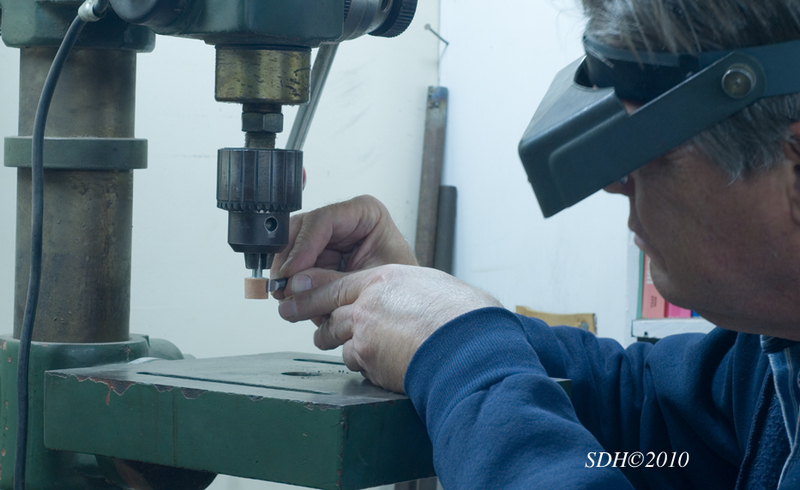 Here’s how I do it: The larger grinding wheel is installed in the drill press chuck and key tightened. At the workbench, I clamp the driver bit in a small drill press vise, aligning the ground part of the bit perfectly vertical by holding a square to the bench top. I place the vise on the drill press table, then raise the table until the ground section of the bit is level with the middle of the grinding wheel. I then lock the table at this height. It is important to note which direction the drill chuck is rotating and to make sure the bit only touches the wheel as it turns away from the tip. In other words, the wheel should sweep away the metal from the shank toward the tip of the bit. This means holding the bit on the right front side of the wheel in a drill press. If the tip is facing into the rotation, the bit could dig into the wheel and cause major problems. This works the same on any grinder; the wheel should rotate away from the tip of the bit. I adjust the speed to a relatively slow setting. 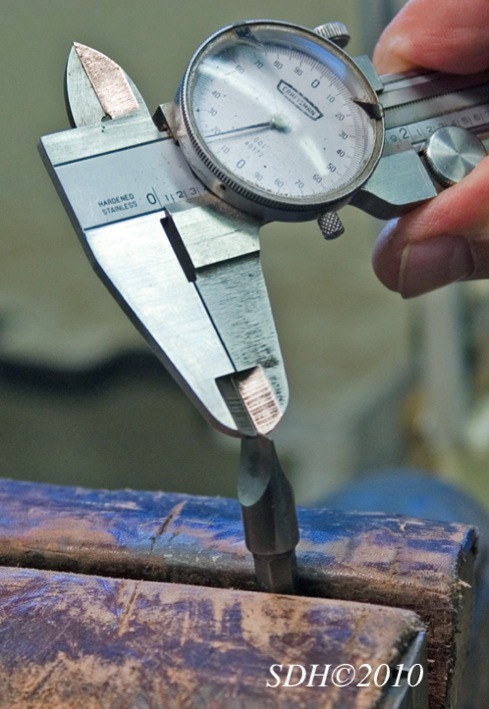 With dial calipers, I measure and note the thickness of the tip before grinding. I determine the desired finished thickness and divide it by two, as half of the metal must come off each side of the bit. (For example, to take a .025-inch-thick bit to .015 inches, I remove .005 inches from each side.) Always wearing safety glasses, I move the bit into the wheel, lightly starting the contact toward the rear of the ground area. I adjust the attitude until the ground section is fully contacting the wheel. Then I back it off and take a look at what’s happening. The author carefully hand-grinds a driver bit to size. The ground area should show an even, shiny surface where the bit was ground by the wheel. If not, I adjust the bit in the vise so there is even contact between the wheel and the bit. With gentle pressure, I’ll grind the desired amount from one side of the bit. (I verify this by measuring the tip with the calipers.) Then I’ll turn the bit over in the vise and grind the other side equally. As a final step, I take a small sharpening stone—one I’d use for a pocketknife—and lightly dress each newly ground edge to remove any burrs that might scratch gunmetal. Some points to remember: It’s a good idea to do a dry run without the wheel in motion. Always approach the wheel carefully and use gentle pressure when grinding. Grind lightly on the first pass to make sure the bit is truly aligned with the wheel. Check both the top and bottom of the tip with calipers to ensure even thickness. It takes less than a minute per side to remove .005 inches of metal from a wide blade. A narrow blade will grind much quicker and is more difficult to position. If you stop to check the evenness of the grinding and the thickness as you go, the bit won’t get very hot. Heat will draw the temper if it’s enough to change the color of the steel. I find grinding a hand-held bit much easier. Then again, my hand-eye coordination is fine-tuned daily, and I wear 4X magnifiers. As I mentioned earlier, if you don’t have screwdrivers, I would recommend the Brownells Magna-Tip Thin Bit set for starters. Again, the eighteen bits come in .020 inch and .025 inch thicknesses, and I suggest grinding six or seven of the .025-inch bits down to .015 inches. Better yet, custom-grind them to fit your shotgun’s screws. Adding more bits for special applications is easy, and you can get them all in one place. This bit has been carefully ground to a thin .017” to fit a screw for a Continental shotgun. In sum, with English, Spanish, and most Continental guns, you will need different width blades, most ground to a thickness of about .015 inches. This is thin, but the slots on many Italian guns are even thinner. For most American guns, a variety of widths with blades .020 to .025 inches thick will work fine.